As big as it gets. The Philadelphia Orchestra is forming its own choir in order to continue its history of performing choral works such as the gargantuan Mahler “Symphony No. 8,” seen here in a March 2016 performance with multiple choirs in Verizon Hall. New, entirely professional, and a child of the Philadelphia Orchestra, the Philadelphia Symphonic Choir would seem to be much-needed good news on the choral landscape. But so far in its formation, some Philadelphia vocal freelancers are experiencing consternation or even heartbreak at how it's being handled. The idea couldn't be more promising. "We want it to be the leading outlet for choral-orchestral repertoire," said Joe Miller, who is founding the group and is also director of the Westminster Choir and the Westminster Symphonic Choir in Princeton. "I'm so excited about building professional opportunity for singers. . . . I hope this will be an outlet for any singer pursuing that." 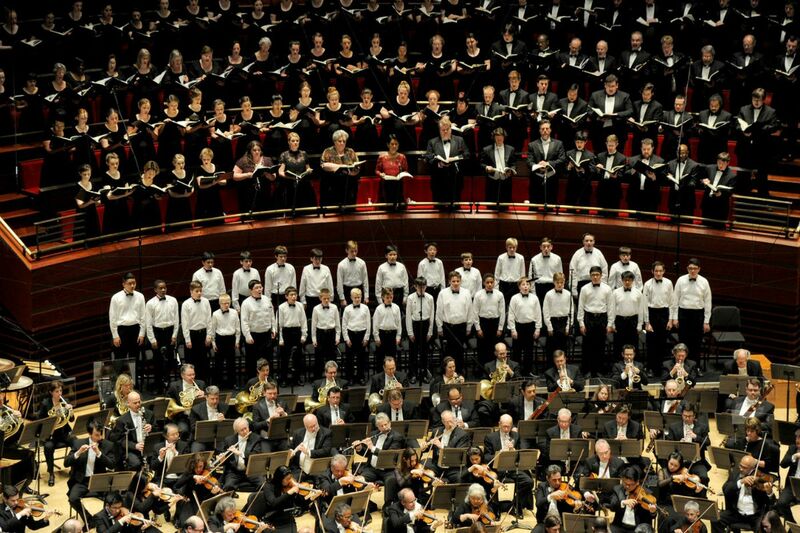 The Philadelphia Orchestra formed its own chorus for the 1916 U.S. premiere of the Mahler Symphony No. 8 under Leopold Stokowski. And the sketchy documentation of the choral scene suggests this may be the first time since then that a new group has been formed by the orchestra with aspirations of permanence. Like many ensembles, the orchestra has relied on existing organizations in recent decades. For many years, the preferred chorus was the partly professional Philadelphia Singers Chorale, which ceased operation in 2015 after 43 years because of financial challenges. Some, however, see the new chorus as yet another step in the decline of freelance opportunities for singers in Philadelphia since the 2008 recession. Complaints - many anonymous, because freelancers don't want to alienate future opportunities - come down to low pay. Some singers who auditioned in May and were offered positions in July - attracted by the prestige of Kimmel Center performances of Carmina Burana under Cristian Macelaru Dec. 8-10, Handel's Messiah Dec. 18, or the Mahler Symphony No. 3 May 18-21 under Yannick Nézet-Séguin - just can't afford it. One is bass Milo Morris, who had to say no to the December Carmina Burana. "I could accept this offer to return home to 'my' orchestra, or I could turn down this insultingly low-paying gig . . . while opening up my schedule for other opportunities during the Christmas season," he wrote in an email. Some singers were offered $400 for rehearsals and performances, but Morris was offered $375 in a tiered payment system. Some singers say that's a morale killer. "From what I've heard . . . few professional singers are accepting this," said Gail Lopez-Henriquez, the local attorney for the American Guild of Musical Artists. "They aren't going to have the same quality that we've had in past." The past she refers to is the Philadelphia Singers Chorale, whose 2013 performance of Carmina Burana with the Philadelphia Orchestra yielded $335.16 for rehearsals and warm-up and $336.60 for three performances. Total: $671.76. Clearly, the situation has hit a nerve among Philadelphia choristers feeling increasingly devalued in their own community. Many who are signing on are recent graduates of Westminster College in Princeton - Miller admitted he has a fair number - with the implications of outsourcing to less-expensive singers in New Jersey. But the situation may be intractable - between singers who want to continue making a living as freelancers and an orchestra under pressure to minimize expenses. Though opera stars are among the most highly paid musicians on earth, choristers - some of whom have chosen family life over a potential solo career - tend to be taken for granted, whether in churches or in the gargantuan Mahler Symphony No. 8. They aren't always as respected as instrumentalists. Some assemble a piecemeal living. Church choirs pay up to $125 for a Sunday's work. Amateur choirs hire a handful of pros. Morris gets $625 for Bucks County Choral Society performances and $725 for the Mendelssohn Club of Philadelphia. That may sound good, until you consider how much is eaten up in travel and parking. The prospect of singing for the Philadelphia Symphonic looks like this for Morris: "I currently live in Riegelsville . . . in Bucks County. A round-trip to Center City eats up a quarter tank of gas. Based on the schedule for Carmina, that was going to be about $90 worth of the fee . . . and that doesn't include parking for days when I can't find a spot on the street." Also, freelance paychecks are unusually vulnerable to repertoire choices. Though orchestras are fairly standardized ensembles, choirs constantly morph according to the needs of any given piece. A small, agile women's chorus is needed for the Mahler Third - in contrast to the large mixed choruses of the Verdi Requiem. Needs also change over time. Handel's Messiah is now done by much smaller choirs, due to recent musicological research. Miller says he lobbied for more money. But Philadelphia Orchestra management (always under pressure to keep costs down in its post-bankruptcy era) talks about keeping the new choir "cost-neutral" (the words of Jeremy Rothman, the orchestra's vice president for artistic planning) or at least even with past Philadelphia Singers performances. Problem is, the paid professionals accounted for only 40 percent or so of these big-chorus Philadelphia Singers Chorale performances; the rest were filled out by volunteers. In the Philadelphia Symphonic Choir, all singers are paid - which means the orchestra is spreading the same money over more than twice as many singers. Also, recent Westminster graduates are perceived as having preference. Local Philadelphia singers say they found out about the auditions only through Westminster contacts. "There's skepticism that this is an insider's club," Rothman says. "That's not the intent. We're learning. We aren't experts right out of the gate. We'll have more auditions in the future. The voices for this year's projects are pretty well set, but we're still looking for male voices to fill out the roster." Having attended Westminster College, Nézet-Séguin often chooses to work with lighter-voiced Westminster choirs - in contrast to the late Wolfgang Sawallisch, who, in his 1990s tenure, wanted a beefier adult sound that the Philadelphia Singers Chorale delivered. That sound has been less welcome outside the big choral works of Berlioz and Verdi. Some singers say that, given a chance, they could readily lighten up for Nézet-Séguin. Miller is quick to point out that the Philadelphia Symphonic Choir is not meant to be a version of the Westminster groups (which have questionable availability in the December and May slots when the orchestra needs singers): "If we were doing Janácek's Glagolitic Mass . . . it's more appropriate for singers 10 years older." However, the chorus could be an investment in the future. Miller's goal is to have a roster of 300 to draw on for the Mahler Eighth. The long-term dream, he says, is a nine-month season of paid employment. A distant mirage? "But I'm going to be advocating," he says.